The Rezgo platform is designed based on an industry recognized multi-tiered architecture. By separating the database, application layer, and presentation layer by using a highly capable XML or JSON messaging layer, we are able to ensure that each service is optimized to its own specific requirements. The Rezgo front-end booking interface, which is shared by all members of the Rezgo platform is built on top of the Rezgo API. By building the Rezgo platform in this way, we have been able to ensure that the API is powerful, robust, extensible, and well documented. We invite developers to consider integrating the Rezgo API into their web, mobile, or even network capable desktop or server applications. Connecting to the Rezgo API allows a developer to get access to product data, media, availability, bookings, and vouchers for a specific provider member. This is particularly useful if you are developing a customized website or booking interface for a Rezgo member who does not want to use the standard white label solution. This type of integration is also useful if the Rezgo provider member is integrating their products into a mobile application or integrating with an existing desktop reservation system. Using the Rezgo API means getting access to a lot of data that isn’t normally available through the regular user interface. If you are looking for reporting that goes beyond those that are already offered within Rezgo, then you can use the API to access booking data and create your own custom reporting solutions. Customers around the world have already built custom reporting scripts that utilize the Rezgo API. Don’t hesitate to contact us if you have questions about using the Rezgo API for custom reporting. 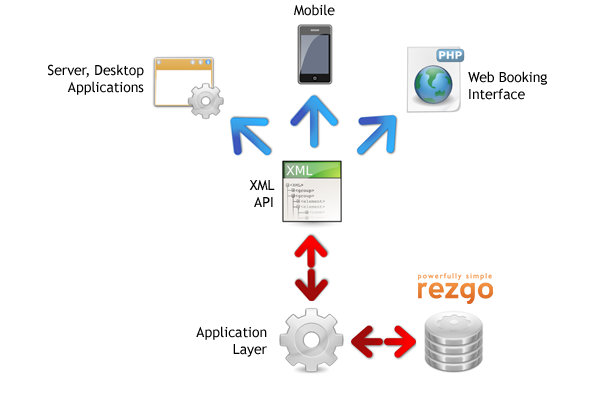 Are you interested in integrating Rezgo into your web application? Are Rezgo customers using your application as well and asking you if booking data can be viewed in your system? Use the Rezgo API to pull provider booking data into your application and make it simple for your customers to work with both applications. We even provide an OAUTH style authentication script that makes it easy for your customers to approve access to their Rezgo accounts from within your own application.